If you’re reading this article, you’ve already done the hard part: You know (or suspect) that you’re supposed to pay quarterly estimated tax on your fellowship using Form 1040-ES. Whether you’re a graduate student, a postdoc, or some other kind of fellow or trainee, if you’re not having tax withheld from your income, it’s pretty likely that you have the responsibility of paying quarterly estimated tax. The main obstacle to PhD students and postdocs paying quarterly estimated tax is simply awareness! 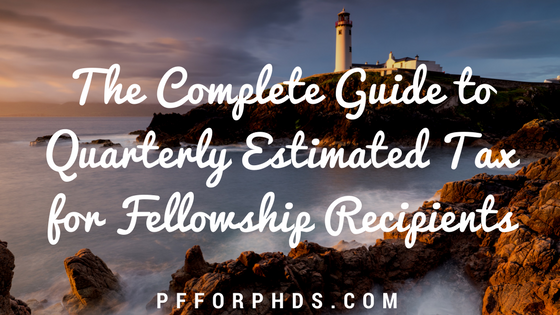 The process itself is not complicated or difficult, as I’ll show you in this complete guide to quarterly estimated tax for fellows. If you’re still unsure that you owe income tax at all on your fellowship income – or you want to help your peers understand this issue as well – I have plenty of articles on that topic in particular. The IRS expects to receive tax payments from you throughout the year, not just in the spring when you file your tax return. Non-employees are almost never extended the courtesy of automatic income tax withholding by their university/institution/funding agency. (Income tax withholding for fellowship/training grant recipients is offered in rare cases – Duke University is one – so it is worth inquiring about, but don’t be surprised if the answer is no.) Instead, the onus is on the individual to manually make tax payments. By the time a person/household files a tax return in the spring of each year, the IRS expects the tax paid throughout the year to be in excess of or only slightly less than the actual amount owed. Approximately 3 in 4 Americans receive a tax refund (the amount of tax paid throughout the year minus the actual amount owed) after filing their tax returns. The rest, presumably, owe some additional tax when they file their tax returns. If the amount of additional tax due (above the amount paid throughout the year) is too high, the IRS will penalize the taxpayer. To help taxpayers avoid underpaying tax throughout the year and being penalized, the IRS has set up a method of making manual tax payments four times per year: quarterly estimated tax payments. Anyone whose primary income isn’t subject to automatic withholding (e.g., fellowship recipients, self-employed people) or who has significant income in addition to their employee income (e.g., investment income) should look into making quarterly estimated tax payments. Your tax deductions and credits are particularly high. Your tax due for the year might be large enough that you are required to make quarterly estimated tax payments or small enough that you can skip the quarterly payments and pay all the tax due at once with your annual tax return. The dividing line is $1,000 of tax due at the end of the year in addition to the tax you had withheld and your refundable credits. If you expect to owe more than $1,000 in additional tax for the year, you should make quarterly tax payments, unless you fall into one of the exception categories discussed in the next section. If you expect to owe less than $1,000 in additional tax, you don’t have to make those quarterly payments and will just pay everything you owe with your annual tax return. For individuals who receive only fellowship income not subject to tax withholding throughout the calendar year, the calculation is straightforward: How much income tax will you owe for the year, greater or less than $1,000? For individuals/households with fellowship income not subject to withholding plus employee income subject to withholding (e.g., one person with part-year fellowship income and part-year employee income, one spouse with fellowship income and one spouse with employee income), both the total amount of tax owed across all incomes and the amount withheld must be taken into consideration. If you will owe more than $1,000 in additional tax at the end of the year, you should file quarterly estimated tax. Some people who owe more than $1,000 in additional tax at the end of the year are not required to make quarterly estimated tax payments. If you had zero tax liability in the previous tax year, you are not required to make quarterly estimated tax payments in the current tax year. For example, if last year you were a undergrad or grad student with no income/a low enough income that you didn’t owe any income tax, you’re not required to make quarterly estimated tax payments this year. If the sum of your tax withholding throughout the year and refundable credits equals or exceeds 90% of the tax you expect to owe this year, you are not required to make quarterly estimated tax payments. For example, if your spouse earns the lion’s share of your household income and has a generous amount of tax withheld automatically, your household’s overall tax withholding might be sufficient to exempt you from making quarterly estimated tax payments on your fellowship. If the sum of your tax withholding throughout the year and refundable credits equals or exceeds 100% of the tax you owed last year, you are not required to make quarterly estimated tax payments. For example, if last year you finished undergrad and started grad school with a stipend, your tax owed for the year was likely quite small. If you have assistantship pay with tax withholding for part of this year and then switch to a fellowship with no withholding, your tax withholding from your assistantship might cover 100% of your tax owed from last year, and you wouldn’t be required to make quarterly estimated tax payments. The best way to estimate your tax due this year along with your withholding and refundable credits and determine whether you are required to pay quarterly estimated tax is to fill out Form 1040-ES. Form 1040-ES, specifically the Estimated Tax Worksheet (p. 8), guides you through 1) estimating the amount of tax you will owe for the year, 2) determining if you are required to make quarterly estimated tax payments, and 3) calculating the amount of your required estimated tax payment. I’ll point out a simple approach to filling out the Estimated Tax Worksheet for individual taxpayers/households with only fellowship and employee income. If you additionally have self-employment income or other types of income, your approach will be more nuanced. If your fellowship income is disbursed frequently throughout the year (e.g., once per month for the entire year), this simple method will work for you. If your fellowship income is disbursed infrequently (e.g., 2-3 times per year) or throughout only part of the year (e.g., only the fall term after switching funding sources), keep reading for an alternative method. Line 1: Your expected Adjusted Gross Income (AGI), which is your total income for the year less your above-the-line deductions (e.g., deductible portion of student loan interest paid, the Tuition and Fees Deduction). Your AGI includes your fellowship income, taxable scholarship income (if applicable), and any wages you (and your spouse) received, e.g., from an assistantship. Line 2: Your deductions. If you plan to itemize your deductions, you should enter the total of those itemized deductions in line 2a; otherwise, enter the amount of your standard deduction (in 2019: single $12,200, married filing jointly $24,400). Line 7: The sum of your credits if you plan to take any. Examples of credits include the Lifetime Learning Credit, the Child Tax Credit, and the Child and Dependent Care Credit. Line 11b: The sum of your refundable credits if you plan to take any, such as the Earned Income Credit or the Additional Child Tax Credit. Line 12b: Your total tax liability for the prior year. Line 13: Income tax you expect to be withheld throughout the year. This can generally be extrapolated from your most recent pay stub. If you come to the worksheet with this set of numbers, all you need to complete it is to follow the arithmetic steps instructed in the form and to look up your tax due using the Tax Rate Schedule on p. 7. Once you fill out the worksheet, line 11c will tell you the total amount of tax that it is estimated you will have to pay for the year. The rest of the form helps you determine the minimum amount of quarterly estimated tax you have to pay to avoid a penalty, which might be $0. Both of these numbers are key for your tax planning for the year; don’t just make the minimum payments necessary and forget that you might owe additional tax along with you tax return in the spring. If you receive your income unevenly throughout the year, the IRS has a method for calculating a different amount of estimated tax due in each quarter, the Annualized Income Installment Method (see Publication 505). If you receive your fellowship income irregularly throughout the year – particularly if you are paid more later in the year than earlier – and want to be very exact about the amount of estimated tax you pay each quarter, you should fill out the Annualized Income Installment Method Worksheet after you complete the Estimated Tax Worksheet. However, the Annualized Income Installment Method is a very complicated and fiddly worksheet, so if you don’t mind just making the regular quarterly payments, perhaps with guesstimate adjustments, that’s going to be faster and easier. For example, if you have tax withholding in place for much of the year through your assistantship but switch to fellowship funding for just the fall semester, your estimated tax payments all need to be made in the last one or two quarters, not the earlier part when you were having tax withheld. If you are required to pay quarterly estimated tax, you have many options for doing so, such as by mail, over the phone, and through the IRS2Go app. The easiest method is most likely through the website IRS.gov/payments, where you can choose to make a direct transfer from your checking account for free or to pay using a debit or credit card for a fee. Please note that these dates are not at 3-month intervals. There are penalties for failing to make estimated tax payments when you are required to do so or underpaying your estimated tax. The penalty is calculated separately for each quarter, so you may be penalized for underpaying in an earlier quarter even if you made up for it in a later quarter. The details about the penalties can be found in Publication 505. Your state and/or local government may also require you to make estimated tax payments. If you are going to owe any income tax for the year and do not have automatic income tax withholding set up, you should intentionally prepare for your tax bill, whether or not that tax is due with your annual tax return or quarterly. My recommendation is to set up a separate savings account labeled “Income Tax” or similar. With every paycheck you receive, transfer into your savings account the amount of money from it that you expect to pay in income tax. For example, if you receive monthly fellowship paychecks, you should set aside 1/12th of the amount you calculated in Line 11c (rounding up). When you pay tax quarterly or annually, draw the payment from that dedicated savings account. If you are married filing jointly with one spouse receiving a fellowship not subject to withholding and one spouse subject to automatic withholding, it is possible to set up the withholding on the employee income so that you don’t have to pay quarterly estimated tax on the fellowship. The idea is that you will increase the automatic withholding on the employee’s income so that it covers what you owe in tax for the year as a couple. This involves filing a new W-4 with your spouse’s employer. There are two types of approaches you can take to increase your spouse’s withholding using Form W-4. The first is to recalculate the appropriate number of allowances to take using the Personal Allowances Worksheet, the Deductions, Adjustments, and Additional Income Worksheet, and possibly the Two-Earner/Multiple Jobs Worksheet. The second is to maintain the number of allowances as they had been (assuming they were accurate) and enter an additional amount of money on Form W-4 Line 6 to have withheld from each paycheck (Form 1040-ES Line 11c divided by the number of paychecks your spouse receives per year). I read your post about how graduate student stipends are not self-employment income, and therefore we don’t have to pay self-employment taxes on them. If I am filing estimated quarterly taxes, do I have to report my income in a particular line to make it clear that it’s not self-employment income? When you pay quarterly estimated tax you actually don’t file any forms; it’s only a transaction. Form 1040-ES is for your own records. When you prepare your annual tax return, you will report your stipend income differently than self-employment income would be (I’m sure you’ve read about that already), and the return just asks for how much you’ve paid in estimated tax on another line. So the short answer is: no reporting/forms and therefore no differentiation at the estimated tax stage.